As an oasis in a post apocalyptic world, the Valley of the Wind shelters a group of people, as well as their beloved princess Nausicaa, from an ever-encroaching forest of toxic fungi which is destroying whole nations. However, when more militant neighbors start fighting to seize this land for their own, can Nausicaa find the will to save all parties interested, as well as the unique life-forms that had evolved on that world... before all are destroyed? 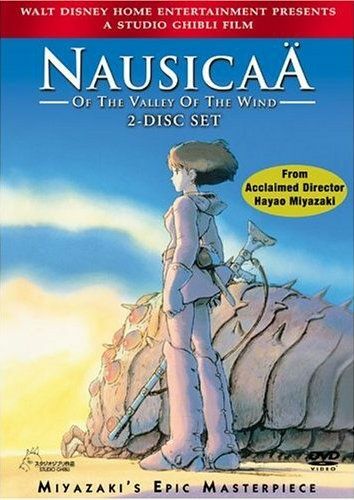 Originally filmed in 1983, "Nausicaa" was based on what has been acknowledged as Hayao Miyazaki's epic manga, which Miyazaki himself stopped drawing to finish the film to wide acclaim in Japan. However, when Streamline Pictures had originally obtained the license to the movie, they had heavily edited it, as well as changing the title to "Warriors of the Wind," which had upset Miyazaki greatly. So when Walt Disney Pictures had received the licenses to Miyazaki's library of work (which will soon include a new dub to his children's classic My Neighbor Totoro from Tokuma (now Studio Ghibli), it was on the condition that the films were to be shown as they were meant to be seen (it was rumored that Miyazaki sent a samurai sword to Disney with the words 'No Cuts' on the scabbard). As a result, in 2004 Disney will release "Nausicaa" in its original length and a new dub for new audiences to enjoy. Nausicaa of the Valley of the Wind is based on the comic that was first seen in Animage in Japan. The special feature about Studio Ghibli on the DVD says that when Mayazaki wanted to make this movie, it was first rejected because someone told him "What's the point of a movie when there is no story to go along with it?" It was first put on Animage, a Japanese magazine on anime, in 1982. Eventually this movie was in production on May 31, 1984. A thousand years ago, men had made giant warriors, and the warriors disintegrated the earth. This was known as the seven days of fire. It was said that giant warriors turned to stone, and the toxic jungle was formed. Over the years men had tried to burn the jungle, all that did was anger the Ohmu. The Ohmu would topple cities, and kill people until they died of starvation. This is how the toxic jungle spread. A thousand years later, there are only three known kingdoms: the Tomikians, Pejites, and the Valley of the wind. A giant warrior was found in Pejite. Lord Yupa is visiting the valley of the wind. King Jhil is bedridden because of the jungle's poisons. There is also a legend that goes "After a thousand years of darkness, he will come. Clad in blue and surrounded by fields of gold." Will the legend come true? Will the Torumekians use the giant warrior? You'll need to see this movie to find out, and if you like the movie, then get all seven mangas. Why get all seven mangas? As The Official Nausicaa Website says "The ending of this manga is likely to surprise you and make you think."